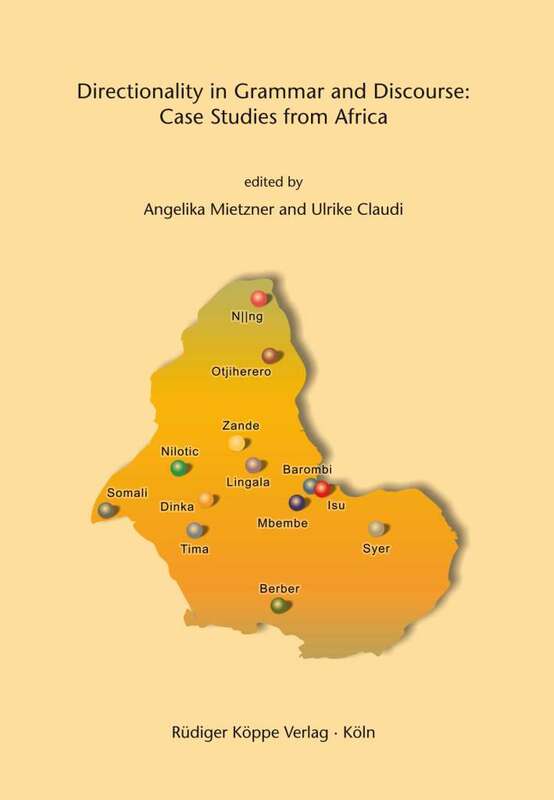 This volume on the expression of directionality in African languages is the output of a workshop Directionality in Grammar and Discourse: Evidence from African Languages that was held at the University of Cologne, Germany in June 10–11, 2010. This workshop on directionality was a continuation of a previous one on “Encoding Motion: Case Studies from Africa”, which was held in 2007. The results of the 2007 workshop have been published under the same title – edited by Angelika Mietzner and Yvonne Treis – see link below. The idea of planning such a workshop was motivated by the fact that a large number of African languages exhibit multiple ways of expressing the direction towards or away from a deictic center, either by fixed morphemes or by other grammatical elements. Former research had also revealed that directional morphology may develop semantics that go beyond the encoding of direction properly. So, the question was: How do African languages encode directionality, and in which way may particular forms receive semantics that have no obvious semantic relation to directionality? The participants presented papers on Afroasiatic, Niger-Congo, Nilo-Saharan and Khoisan languages, i.e. on languages of all of the four African language phyla: the Afroasiatic phylum is represented by Berber (Fleisch) and Somali (Northern Cushitic; Claudi). Niger-Congo is represented by Tima (Eastern Sudanic; Dimmendaal et al. ), Zande (Ubangi; Pasch), Mbembe (Jukunoid; Richter gen. Kemmermann), Syer (Senufo; Dom­brow­sky-Hahn), as well as by Bantu languages (Atindogbé, Möhlig, Nassenstein). Nilo-Saharan languages are represented by languages of the Eastern Sudanic branch, Dinka (Western Nilotic; Andersen), Nilotic (Mietzner) and Nubian (Jakobi). One Khoisan language was investigated, namely Nǁng (Ernszt). As evidenced by all the sample material discussed in the book, African languages use various grammatical means to provide precise location or motion towards or away from a deictic center. However, the authors go far beyond in their investigations and demonstrate how metaphor and pragmatic strengthening transfer the expressions primarily associated with spatial concepts onto many other cognitive domains, including: vision, orientation, social interactions, and highly abstract grammaticalized domains. Hence, directionality appears as a broad concept covering various functions of language specific grams (lexical expressions, particles, morphemes) used in a number of different pragmatic contexts. In addition, many authors provide a diachronic aspect of analysis and trace directional grams to their etymological sources, which include, among others, verbs of motion and body part terms. [...] To conclude, the volume provides a lot of valuable linguistic material and analyses and can be recommended to all interested in African languages and typological studies.